AEA provides building performance services to the Southeast Michigan area. We use the Whole-House approach to energy efficiency. 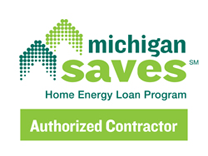 As of February 8, 2016, the Michigan Residential code has adopted new amendments from the 2015 International Energy Conservation Code (IECC) that is going to make all new construction much more efficient whether you are builder or homeowner. There is a lot of new information in these codes. If you want a company that is proven and reliable to do your testing, call us. Make sure you have the right company doing your testing. We provide and accurate blower door test and the necessary stickers and paperwork for the building officials. Besides testing, our mission is to educate and make houses healthier and more efficient. The new code requires a third party blower door test for all new construction or additions. We have tested thousands of homes and have been QA tested by all our trade ally partners many times and have passed. Make sure you have a quality company doing your testing. $250 - Under 2,500 sq. ft. Under the new code provisions, all ductwork outside the thermal envelope needs to have a pressurized test for leakage. Unsealed ducts in houses can lose up to 30% of direct air through leakage. If you have ductwork in unconditioned areas such as a garage or attic you can be picking up all sorts of contaminates and distributing them through the house. Dust, water, and mold can also build up in duct work that can cause a variety of health problems. Call us to have your home tested. $250 - Duct blast testing for each furnace on houses under 2,500 sq. ft.
$10 for each additional 100 sq. ft.